Category Archives for "Food & Treats"
Dog Training Treats, The Cornerstone of Positive Dog Training! Positive dog training is reward based and motivational. Training your dog in a positive manner will ensure that the two of you have a great relationship. Communication is increased immensely by reward based training, and reinforcement alongside reward is a really enjoyable way to teach your dog. Some dogs have little interest in training treats. The toy motivated dog will work nicely for a tennis ball or tug on a toy rope. Most dogs however will become quickly and easily motivated by a whiff of smelly cheese or liver sausage. By introducing dog training treats into your training sessions you will see the difference in your dog immediately. He will become motivated and want to earn his reward. He will be alert to the potential result of his behavior and responses. Your dog will perform knowing that a reward is possible. It is a similar response to the human pay increase. Pet shops sell many varieties of dog training treats. Some catered to the dog’s great sense of smell. Scent of nice treats can be extremely motivational to your dog. Similar to a freshly cooked meal that will make our mouths water in anticipation. Some pet shop treats are already catered to dog training and use with the clicker. It is not necessary to buy pet shop dog training treats. Leftover meat or cheap sandwich meat will easily get a dog switched on to learning for his reward. Small squares of cheese will present the same result and for hungrier dog’s part of their daily meal. When you know your dog you will be able to tell if his interest is piqued by a particular treat. You can test him out with various small amounts and see which he likes the best, and then you can use the favorite for ultimate motivation. There is little point using the treat that your dog likes best to carry out easy tasks. Reward should reflect motivational level needed. By beginning with lowest level of reward you can gradually build to higher value dog training treats to build your dog’s motivation. Here are some ideas for reward treats beginning with lower value treats and working to the elite and tastiest food reward. Be careful with some human food. Any chocolate that is not specifically for dogs carries a toxic ingredient that is poisonous to the canine so steer well clear of this. Also be aware that much excess food in the form of dog training treats can cause weight gain. To provide an effective motivational reward dog training treats should be tiny. A taste will leave your dog wanting more. Slivers of ham just big enough for your dog to taste will be sufficient reward. Think how the first tiny half square of tasty chocolate makes you feel, much better than you feel after devouring a large block of the same treat. It is paramount that you leave your dog wanting more throughout and at the end of a training session. If dog training treats are too big your dog will lose learning momentum whilst the takes the time to eat them. He will also tire of them quicker therefore his motivation will wane sooner. You can utilize the value of treats during training sessions. By having a stash of mixed treats ready your dog will never know if he is getting an average treat (piece of kibble) or something really special (square of liver) By alternating reward value you will maintain the motivation of your dog. 1. Chocolate– While most of us enjoy eating a delicious piece of chocolate, chocolate can be very lethal to your dog. It’s not the chocolate itself which is harmful to your dog, but rather the theobromine contained within the chocolate. Theobromine can cause different reactions in dogs; if your dog has epilepsy, then theobromine can trigger epileptic seizures. Other effects include cardiac irregularity, internal bleeding, cardiac arrhythmia and death. 2. Walnuts– Walnuts are considered a very healthy food for humans; however walnuts (amongst many other kinds of nuts) can have harmful side effects on dogs and are considered poisonous to dogs. Because of their high phosphorous content, walnuts can potentially give your dog bladder stones. 3. Onions– It’s not like your dog will enjoy eating those stinky things anyways, but you should definitely avoid feeding your dog onions. Onions, especially raw ones, are known to cause hemolytic anemia in dogs. Hemolytic anemia is where red blood cells are removed and destroyed from toxic compounds. 4. Potatoes– Poisoning from potatoes have been known to occur for both humans and dogs. This is from the Solanum alkaloid that is found in green sprouts and green potato plants. However, this doesn’t mean that all forms of potatoes are bad for your dog. Mashed and cooked potatoes are actually quite nutritious and healthy for your dog, but stay away from raw uncooked potatoes. 5. Turkey Skin– When Thanksgiving rolls around, the last thing you want to do is feed your dog leftover turkey. Turkey Skin has been found to cause acute Pancreaitis in dogs. Pancreaitis is where the pancreas becomes inflamed and can lead to bleeding in the gland, tissue damage and infections. 6. Sugarless Candy– Candy may be a great treat for kids, but they are definitively a big no-no for dogs. Some candies contain a compound called xylithol which can lead to liver damage and death in dogs. 7. Sugar-Free Gum– Another one that most people don’t know about is sugar-free gum, specifically those that contain xylitol as the artificial sweetener (xylitol can also be found in human toothpaste and mouth wash). It can cause hypoglycemia (low blood sugar) for days, thereby causing seizures, and sometimes even liver failure. Both of which can cause death in severe cases. 8. Grapes– One grape wouldn’t be toxic to your dog, however one study which was done by the ASPCA handled a study of 140 dogs and the effects of grapes on the dogs. A third of them developed symptoms of vomiting to kidney failure – however they say that the dog had consumed between 9 ounces to 2 pounds of grapes. If you’ve fed any of these foods poisonous to dogs recently, it’s recommended you contact your veterinarian as soon as possible. 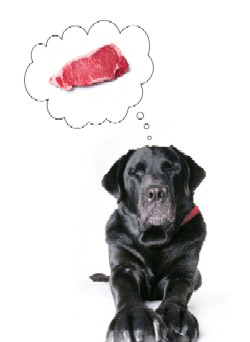 It is important to note that different types of foods can have different effects on your dog. Some dogs may be more tolerant than others, so please be very cautious when giving your dog any type of food that he doesn’t regularly eat. Feeding your dog is the most fundamental way to care and to promote a healthy life for your dog. 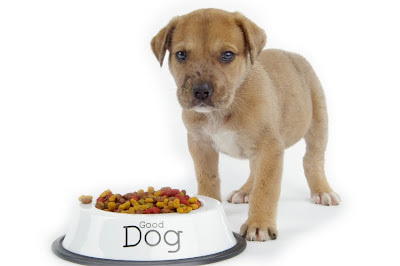 Good dog food will help your dog fight diseases and to keep him healthy. It is of no surprise that the majority of dog owners spend more money on dog food than any other expenses for their dog. But choosing a brand or type of dog food can sometimes be confusing. A dog food that has a label “Premium”, “Premium Ultra”, or “Holistic” does not guarantee that the food was prepared using high quality ingredients. So the more you know about commercial dog foods and what the label means, then it become easier for you to choose a good dog food brand for your dog. There are basically two choices of commercial dog foods. There is either the kibble type or the canned type dog foods. Both contain mostly the same ingredients, but the kibble type had the water removed through the process of extrusion or baking. This gives the dog food a crunchy appeal while at the same time ensuring a long shelf life. The water is kept in canned dog foods, so it must be sealed in a can to keep it fresh. Less expensive than canned dog food. Has a very long shelf life. Available in many flavors, types and formulas. Ability to buy in bulk. May contain more vitamins & enzymes due to the fact that the food did not go though the process of extrusion. Long shelf life (with the can unopened). Easier to chew and picky eaters like it better. Must refrigerate any remaining food. The label on the packaging can tell you a lot of information regarding the quality of the dog food. On the front you should see the brand of food, whether it is for puppies, adults or seniors. But also on the bag, you will find additional text that will describe in greater details the content of the food. This is usually found in the back or the side of the bag of kibble. Within this text, you should find a list of ingredients that was used to manufacture the dog food. Although the amount of each ingredient is not listed, the manufacturers must list each ingredient in descending order according to weight. So if the first ingredient on that list is rice, then the food contains more rice than any other ingredient. If chicken is the first ingredient, then there are more chicken than any other ingredient. Dogs require a high-quality protein so they usually do better on dog foods that have meat ingredients listed in the first two ingredients. Animal fat (Chicken or Beef): Fat obtained from the tissue during the process of rendering and extracting. Grains: This usually includes one of the following: whole, ground, cracked, barley, wheat, rice, oats, brown rice or any other grains. Meat by-products: The parts of slaughtered mammals other than meat. This includes lungs, kidneys, brains, livers, blood, bones and intestines. Meat or fresh meat: The flesh which includes muscles, tongue, heart and skin. Poultry: The flesh and skins of poultry, it may include bones or not. Poultry by-product meal: The rendered parts of poultry, this includes necks, feet, intestines. As you can see from this list, it is best to avoid the dog foods which contain by-products. Usually the more expensive brands of good dog food contain better ingredients, but you should always read the list of ingredients. Also, the majority of good dog food manufacturers will print their website address on the packaging, which you can usually find additional information about the brand and dog food, like how it was prepared and whether or not it contains by-products. If you are currently feeding your dog a brand of dog food and you wish to switch to a new brand, you will first need to transition your dog to the new food. Begin by mixing your dog’s daily food amount with half of the new brand and half of the old brand. This will usually avoid diarrhea and other common problems that occur when changing dog foods. Dogs have been living a healthy life with humans for thousands of years. (Vilmos Csanyi, in his book “If Dogs Could Talk” 1, says the oldest dog skeletons found are about 14,000 years old.) Yet in this twenty-first century, dog owners face a barrage of advertising, aimed at convincing us to buy commercial dog food. Much of this advertising suggests that feeding a dog raw food is a highly complicated process, best left to the “experts”, those who package so-called “complete” foods. If feeding dogs is so difficult, how did humans manage so successfully in the past? Perhaps the same way they fed themselves and their children – through the use of common sense and an understanding of the needs of their dogs. Some of the carcasses suggested by Tom Lonsdale include rats, mice, rabbits, fish, chicken/hens, or, for large dogs, calves, goats, lambs, pigs. Raw meaty bones include chicken and turkey back and frames, whole fish and fish heads, larger carcasses cut into manageable parts, by-products such as pigs’ trotters and heads, sheep heads, or tail bones. He lists offal such as liver, lungs, trachea, hearts, tripe, tongues, amongst others. “Raw meaty bones” doesn’t mean a bone that has had the meat removed. It means a bone within a covering of nutritious meat. Gnawing, tearing and ripping the meat, tossing the meal from side to side in the mouth, before consuming the bone itself, gets the dog’s stomach juices pumping and cleans the dog’s teeth. As Dr. Sasha Herbert says in her book, “nibble munch chomp” 3, carnivores “don’t just stick to the muscle meat. If they did, they would be lacking all sorts of important minerals, vitamins, fiber and fats.” So if we decide to feed raw, we need to include a range of animal parts, including organ meat and bones. If you are interested in finding out more about dog raw food, you might like to browse the information on TomLonsdale’s raw meaty bones site or join the Yahoo! Raw Feeding interest group, where you will find helpful guidance from those who have already switched their pets to this diet. The next question you need to consider is whether to include plant matter. Dr Ian Billinghurst, author of “Give your dog a bone: a practical commonsense way to feed dogs for a long healthy life” 4, argues that wild dogs and wolves would eat some vegetable matter, perhaps as the partially digested stomach contents of prey. For information on this aspect of feeding you could visit his site, Barf World. (BARF has been variously described as Biologically Appropriate Raw Food, Biologically Appropriate Real Food or Bones and Raw Food). 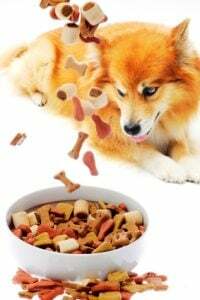 Although there is disagreement in the world of dog raw food on whether to include vegetable matter or supplements, both sides of the debate are convinced that dogs do not need to eat grains – a major component of commercial dried foods. It’s not rocket science. With some research and some commonsense we can feed our dog raw food and an appropriate healthy diet. 1 Vilmos Csanyi, If Dogs Could Talk, translation by Richard E Quandt. 2005, North Point Press, NY, US. 2 Tom Lonsdale, Work wonders; Feed Your Dog Raw Meaty Bones. 2005, Rivetco P/L, NSW, Australia. 3 Sasha Herbert, nibble munch chomp: The art and science of feeding your pet.2007, JoJo Publishing in conjunction with Lort Smith Animal Hospital, North Melbourne, Australia. 4 Ian Billinghurst, Give your dog a bone: practical commonsense way to feed dogs for a long healthy life. 1993, Warrigal, Australia. 5 Ian Billinghurst, BARF World: What is BARF?